In Leon earlier today, the biotechnology company mAbxience, specialized in the development of biosimilars – monoclonal antibodies, to be specific – officially opened the first single-use technology plant in Spain focused on the development of these medicines. The facilites will house the development projects forming the group’s pipeline activity and it is expected that, in the future, it will also house production of the biosimilar medicines that will supply the main regulated markets. Since it began its activity in 2009, the company has invested over 115 million euros. This represents one of the largest investments by a group of Spanish origin in a biotechnology project. mAbxience acquired the Genhelix plant in May 2014 for 11 million euros. Since then, it has spent an additional 14 million euros on upgrading the facilites and adapting them to the needs of the project. This financial effort has transformed the facility into a European benchmark in the field of research and development of biosimilars. 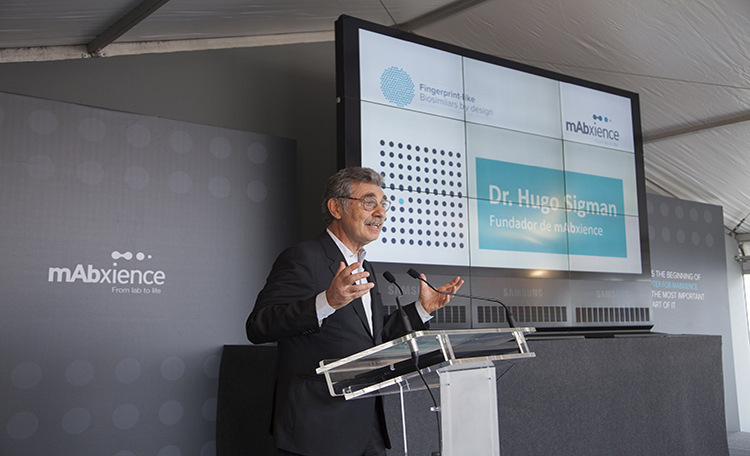 According to the founder of mAbxience, Hugo Sigman, “having a facility of this nature in Europe strengthens our internationalization plans but, above all, helps make these medicines more accessible. Spain is a country we know very well, meaning it was the ideal place to launch this project. Hence our commitment to supporting its growth through our focus on a sector of such great added social and economic value as biotechnology”. In this regard, mAbxience has made a firm commitment to technological innovation by equipping its facilites with the most cutting-edge processes. In fact, the facility in Leon is the first in Spain with single-use technology installed in all its procedures. This technology consists of using disposable bioreactors, which offer greater flexibility and enable a significant saving in terms of the resources used during the production processes. The facilites in León cover a total area of 16,000 m2, of which over 5,500 m2 are for development and production. They include an industrial plant with 2,000-litre bioreactors, a pilot facility, R&D laboratories, quality control laboratories and warehouses. The company currently employs more than 160 people, of which 60 are located in León. In fact, the workforce in the regional capital of León has grown six-fold over the last year. According to the Managing Director of mAbxience, Carlos Bañado, “our commitment to job creation and attracting and retaining national and local talent couldn’t be stronger. Our teams are made up by experts in the field of monoclonal antibody R&D. They are young, multi-disciplinary teams with an international profile, supporting our intention to transform León into a European benchmark for the development of biosimilars”. It is expected that biosimilars will be initially marketed at a significant discount when compared to the price of benchmark drugs, although the reduction could increase as competition in the market expands. This means that biosimilars could release resources aimed at guaranteeing accessibility for more patients to biotechnological treatments and financing those treatments that still have no alternative, thereby also boosting the sustainability of national health systems. mAbxience is a biotechnology company specialized in the development and manufacture of biosimilar monoclonal antibodies that belongs to the pharmaceutical group Chemo. Set up in 2009, it currently has two facilitiess: a development and production facility in León (Spain) and in Buenos Aires (Argentina). In December 2014, it launched its first biosimilar in the Argentinian market, Rituximab. mAbxience maintains a commitment to globality with a constant focus on the highest quality standards in order to foster market penetration by biosimilar medicines. So much so, in fact, that it refers to its working methodology as fingerprint-like (in reference to the concept coined by the FDA), according to which it guarantees that each product is similar to the original with the same genetic fidelity and precision as a human fingerprint. The company, which has a team of over 160 professionals worldwide, has invested over 115 million euros since it began operating six years ago. Chemo Group, set up in Barcelona in 1977, has been operating for over 35 years in all areas of the chemical-pharmaceutical industry and has a professional team comprising over 5,000 people in 40 countries around the world.